Now that summer is fully behind us, we can get a picture of how strong meat demand was during this time. In short, it was a good quarter for the U.S. economy in general and also for beef and other meat demand. 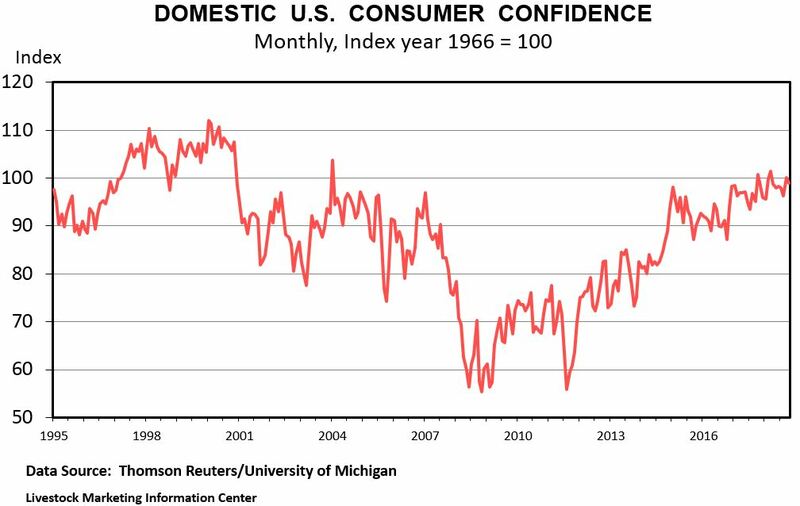 Consumer confidence continued to grow during this time and that boosts consumer spending. The following is a mix of my commentary and that of my colleagues at the Livestock Marketing Information Center. The net value of goods and service produced by the U.S. economy during the summer quarter (July, August, September) increased at a 3.5% annual rate. That followed a solid Spring quarter, which was up 4.2%. Sustained U.S. economic growth rate over the last six months was the strongest since 2014. Consumers played a pivotal role in that growth by upping spending at a 3.8% to 4.0% rate. Consumer spending choices during the last six months reflected a preference for bigger-ticket discretionary purchases such as autos, furniture, and recreational goods. The latter category registered 9.4% and 12.4% quarter-to-quarter gains in the last two quarters. But it was also a good quarter for food and specifically beef purchases. The spending category labeled “food and beverages purchased for off-premises consumption” (mostly grocery store purchases) was up 2.8% and 4.0% for the Spring and Summer quarters, respectively. Those increases fall into the middle range of growth for this sector during the last two years. Meanwhile, the spending category “food services and accommodations” jumped 8.1% and 6.9% during the Spring and Summer quarters, capturing the preference for away-from-home (restaurants) meals. Wholesale market measures of beef demand were consistent with trends in consumer spending choices. Beef has more exposure to foodservice marketing channels than pork. The Choice beef cutout this summer was up 3% from a year ago, even as beef supplies from steers and heifers increased by 0.5%. More product sold at a higher price is the essence of favorable demand. Impressive export growth also played a role in this situation. By comparison, pork production was up 1.2% from a year earlier during the Summer, and hog carcass values were down 17% from the previous year. Lack of foodservice efforts to promote bacon was a noticeable difference this year compared to last year. Market conditions for chicken suggest problems. Breast meat values in wholesale marketing channels were down 23% from a year ago during the Summer with production only up 3.5%. In total, beef demand was strong during the Spring and Summer of 2018 and this helped support prices in spite of larger supplies. Beef demand was bolstered by strong grocery store spending and strong restaurant spending.